What a busy week! It was hard to know where exactly to start until I read Bill's reflections. It made my #1 reflection much easier! 2) I got a student teacher this week. She is a lovely person, and my students love her. Unfortunately, the Ohio Department of Education currently has a license for 4th - 9th grade teachers that forces them to specialize. My student teacher's specialty is math/science, 2 subjects I haven't taught for the last two years because of my curricular support position in language arts. This year, I am in a self-contained classroom and teach all content area subjects. It would not be a stretch for me to make an argument about why math and science teachers need to have a strong literacy base of knowledge. However, rules are rules, and guidelines are guidelines, so my student teacher will be with me for just 4 more weeks, and then will move on to a middle school for her total immersion into teaching. I am trying to impress upon her how important workshop model is, whether it's for literacy or for math and science. Students need to have lessons, and then they need lots of opportunities to do practical applications of what they have learned. The other part of workshop I'm stressing is, during this work time, the teacher needs to be meeting with individuals or small groups to help them with skills that are giving them difficulty. This is good teaching practice, no matter what the subject area. 3) Two of the reading strategy groups I met with this week are students who need to be stretched a little. I taught them how to annotate, and most of them loved it! Since they are naturally strong readers, they sometimes read quickly through texts. They shared with me that annotating forced them to slow down and pay more attention to details they might have missed. It also helped them focus on vocabulary they didn't know; words that they only guessed at before. Now, they've tried to use context clues, and actually make a habit of having a dictionary by their side as they read. Next week, we'll be chatting about theme, author's message, and inferring the motivations of characters. Cool stuff!!! 4) I started a new read aloud with my students and they are loving it -- The Gollywhopper Games (see my review). We're going to have a lot of fun with this one. It's a good contrast from our last read aloud, The City of Ember. a) Her x-c coach nominated her to be an OCC (Ohio Capital Conference) scholar athlete, and b) She was named a member of the Student Athletic Council for her high school. One senior athlete from each sport is represented. After such a tough season, these are two very nice recognitions. 6) Finally, I'm wondering why I'm having such difficulty getting to read books and blog about them. I hope I figure it out sometime soon! Okay, so this may be two weeks worth since I didn't "reflect" last week. 1. My 17 year old daughter got her driver's license last Tuesday. While my wife and I couldn't wait for her to achieve this mile stone for the independence it would give us, I must admit I'm a little hesitant about the independence it gives her. I'm reminded of the first time we took the training wheels off and she took off down the street. She's back on four wheels, and able to get even further from home. Fortunately, as my daughter herself says, she drives "like a grandma!" 2. Speaking of getting further from home, the same daughter is a junior in high school and tomorrow we will go on our first official college visit. Strangely enough, it's back to Ashland where my wife and I grew up! Am I really old enough to have a child looking at colleges? Hard for me to believe, but the answer is yes. 3. We have chosen Greetings From Planet Earth as our first Grand Discussion book which will be held next Thursday, November 6. So far much of the feedback from parents has been extremely positive about the book. One of my volunteers today told me that her son informed her that the book was historical fiction. She seemed a bit taken by surprise that a book written about a time period that we remembered is considered historical fiction. Yet another example of how our kids make us feel older. 4. I was reminded yet again of how much I love my job yesterday. The annual Fall Harvest, (Halloween) parties were held at our school, and there wasn't one in my classroom! At the top of my list of reasons I love being the librarian, is NO CLASSROOM PARTIES!! On the same note, Frankie at A Year of Reading emailed me this morning saying the same thing, no classroom parties and no grade cards, for Frankie, it's the first time in 22 years! WE LOVE OUR JOB! -"I didn't like it any better the second time." This from a student who loved our read aloud so much, he got his own City of Ember book and read ahead so he could go see the movie the weekend it premiered. He managed not to let any of the movie secrets out of the bag because he didn't want to ruin it for me. But he loves Jeanne Du Prau. He is reading The People of Sparks, and should soon be starting The Diamond of Darkhold. Another fun note on this one, is that now his dad is hooked and reading all 4 books! - One parent shared that he had not read the book, but really enjoyed the movie. None of the things that troubled me about deviations from the text got in the way of his enjoyment of a thriller of a movie. - Standing outside the movie theater with a big circle of some of my students, we did a quick vote on who liked the book better and who liked the movie better. Nine out of ten DEFINITELY liked the book better!! - "I wonder why they didn't mention about the mole in the book. I thought the book was different, but I enjoyed the book and the movie too!" - "I liked the book more than the movie. I liked how they found the boats more in the book." - "I liked The City of Ember book because there was a longer journey to Sparks, but I didn't like it because it wasn't as fun of a journey. In the movie, I didn't like it when the guy at the desk already knew about the storeroom, so he took Lina to the mayor." - "I think the movie would have been better off without the mole." - "I never imagined the river where the generator was. I imagined the Pipeworks walls to be nothing but dirt and wires instead of looking so technical." - "I liked the book and the movie the same. What I liked about the movie more than the book is how the lockers turned into boats. What I liked about the book more than the movie is how they had to figure out what candles and matches are." - "I like the book better than the movie. I like how they find the boats better in the movie." - "I like how the Instructions are in the shape of the city in the movie." - "I hated the rat/mole, but liked it when it ate the mayor." - "This may sound cruel, but I really did not like the mayor so I was happy when he got eaten by the mole." - "I liked the book a lot better than the movie because the movie skipped a lot of good parts, and 5 minutes into the movie, you were halfway into the book. It felt like it went very fast." - "I loved how Doon, Lina, and Poppy found the boats. I also loved the mole." - "I liked the mole because he made it really exciting (and because he ate the mayor). I also liked the way they got out in the movie." - "I thought City of Ember, the movie, wasn't as intense as the book." - "I wish that in the book the lockers would have been the boats like they were in the movie." - "I think it's cool that Lina and Doon's dads were working together." **So, there you have it. Mini-reviews of the movie vs. the book by my students. Each month when the new issue of School Library Journal comes out, I immediately turn to the reviews. I know it's a geeky librarian thing, but I really can't wait to see what's new. Unfortunately, right now I'm about a month behind in my reading as I have been busy working to become a better librarian by taking a class working toward my librarian teaching certificate. So when I read a really good book in my limited free time, I get very excited. I had not heard of this book, but the review looked interesting so I reserved a copy at my branch of the public library, and when I started reading it, I couldn't put it down. Set in 1968, Delores Colchester, called Itch by her grandfather, is being raised by her grandparents in Florida. Life is good, she's got a best friend who isn't all prissy and likes to fish. She's got a grampa that loves her and his 1958 turquoise convertible Chevy Bel Air, a gruff but loving grandma that worries about her all of the time, and a thinking swing. Suddenly, grampa has a heart attack and dies in his sleep while sitting in his favorite automobile, and Itch's life is about to change drastically. In order to move on, Grandma Eunice decides to move the both of them to Ohio to a trailer next door to her cousin Effie. Since they can't drive, they hire one of the locals to drive them and their belongings to Ohio and Itch starts her new life. On one of her first days in Ohio, she discovers the fairgrounds and a girl about her age, Gwendolyn (Wendy), twirling her baton as she practices for the talent show that will open the fair. The two become friends, and Itch and her grandma attend the show to see Wendy win for the sixth time in a row. Something doesn't quite add up for Itch when when she watches Wendy perform, for all of the perfection, Wendy just doesn't seem too happy. The two meet up again during the first weeks of school, although Wendy isn't in school for the first several days, and Itch becomes friends with the other girls at the Breck Girl table, Anne Marie and Connie. Not exactly the kind of girls that Itch would have been caught dead with before, she makes it work along with another friendship with Billy the paper boy who is also in school with them. Itch begins to see that Wendy's "perfect" life of dance lessons, stage presence coaching, baton lessons and competitions isn't all it's cracked up to be. She also begins to see the evidence of abuse on Wendy's back and legs. Itch becomes intrigued and starts to ask questions that are answered with vague excuses of absence from school due to sickness and general clumsiness. Eventually Itch witnesses an episode in which Wendy is abused by her mother and finally has the courage to speak up thanks to her grandmother's help. The characters in this book are awesome. I love Itch's grandfather who is a no nonsense guy who is not afraid to stand up for what is right. He speaks his mind when he has an opinion, and probably loses friends for it, however, when he passes on, everyone in town attends his services out of respect. He is also full of homespun advice that sticks with Itch, even when he's gone. Grandma Eunice is a tough old gal who cares deeply for her grand daughter, but shows it in different, less affectionate ways. One of my favorite parts of the book is watching Itch and her grandma grow ever closer after grampa dies. Itch and Billy Applegate develop a friendship that borders on the like, like variety, but author Kwasney keeps it simple and innocent as it should be. All in all, this is a fabulous book! Even though it deals with such a serious topic ,author Michelle D. Kwasney manages to mix in some humor through the grandparent characters. 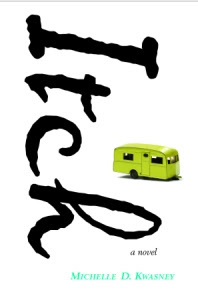 Itch: a Novel develops characters and builds the plot to the climactic events about as well as anything I've read this year and the beauty of it is, is that this book can be read and understood by our fourth and fifth grade readers. I'm not sure how this book didn't receive much attention, it's one of the best I've read this year. And finally, the cover really caught my eye, there's something about those books with trailers on the front this year! Today, another teacher and I invited our students and their families to join us at our local movie theater to watch the movie, City of Ember. We had both recently finished reading aloud the book of the same name to our classes, and this seemed like a fun extension of the read aloud. We were amazed at the turnout for this movie on a beautiful Sunday afternoon. With the exception of 2 other families, our students, their siblings and/or parents, and the two of us practically filled the entire theater. Most people first made a stop at the snack bar (after all, what's a movie without the popcorn?! ), and then we were ready to begin. I actually liked the beginning of the movie a great deal. It really set up the importance of what the "Builders" had decided to do to help the continuation of mankind. It also gave me a visual of what the box that was passed from Mayor to Mayor looked like. The box was a little more high-tech and sci-fi than I had imagined, but it worked for this movie. I loved how it literally showed the box being passed from one mayor to the next, and it also displayed how many years were left until the box would open by itself. Again, I enjoyed the foreshadowing of the last stop it made when it passed into hands that were holding yarn before being shoved into a closet full of even more yarn (those of you who read the book know what I'm talking about). Nice technique. When we finally see Ember for the first time, it was much as I had expected: dull colors for both clothes and buildings, light fixtures everywhere (though the hanging ones confused me a little), Clary's greenhouses, Doon's home, his father's shop with all its invented gadgets, Lina's home, and Granny's yarn store, with yarn everywhere. Things that weren't quite as I had pictured: robots in Doon's father's shop, Ember is in more of a circular shape, and Assignment Day was different. It wasn't bad, just different. Bill Murray is good as the mayor, but he's not quite as grotesque as the mayor I pictured from the book. The actor that plays Looper is perfect casting. Lina (turns out I've been pronouncing her name incorrectly) and Doon were ok for me, but Poppy was darling! As we sat in our seats, I realized I was riveted by most of the movie. Could have definitely done without the gigantic mole in the Pipeworks, even though it did serve a purpose toward the end. There were enough of my favorite parts of the book included in the movie to satisfy me: Poppy chewing on the Instructions in the closet while Granny is tearing apart the furniture, Clary being a good friend to Lina, Doon and Lina finding the mayor in his secret room with his hoarded stash, Lizzie spilling her stolen cans all over the street in front of Lina, the power outages. I'm a realist enough to know that not all could be included from the book into the movie, so I was fine with that. However, what I didn't enjoy as much in the movie is a pretty big deal: the process of solving the mystery of what the Instructions said. We had so much fun doing that as a class; I was sorry to see it glossed over. Lina and Doon worked so hard at solving the puzzle in the book; it just sort of fell together in the movie. I also liked the actual Instructions in the book, and therefore, the mode of escape. Things felt slightly contrived in the movie, and again, they seemed to be going for more of a high-tech escape. I will say that having the boats right in front of us the entire movie was fun after I realized what they actually were -- very clever. Still, I personally liked how basic the escape was in the book: boats, paddles, candles, matches, river... GO! I earlier said how much I enjoyed the beginning. The same can be said for two parts of the ending. When they climb the stairs from the river, and enter the room with signs all around it, things start to click into place, and brings the movie full circle -- nice touch. I also liked the twist of whose feet the note, attached to the rock, lands on. Bottom line, I was very happy I got to see this movie with my students. There was a shared feeling of excitement in the theater that was almost palpable. The conversations outside the theater when the movie was over were loud, excited, full of energy, and priceless. I think activities like this are just one more way for us, as teachers, to get our students to lead literate lives. So, that's what I thought about the movie. Tune in tomorrow to see what our students had to say about City of Ember. 1) My youngest daughter, the same daughter who brought home a cap and gown order form two weeks ago, will be turning 18 at midnight tonight. It certainly makes me reflect on how fleeting time can be. She may be a legal adult now, but, for me, she is still my little girl. 2) After spending much of the first 6 weeks of school getting to know my students as readers and writers through interviews, assessments, and conferences, this week I started reading and writing strategy groups with my kids. In our reading workshop, strategy groups take place during the independent work phase of the workshop. I feel that the work we do in these smaller groups really helps each child grow as a reader. I absolutely love this learning opportunity with my students. 3) I found out yesterday that I will be getting a student teacher this coming Monday. This weekend, I am going to really reflect on what I want her to know about reading workshop and writing workshop. In fact, in our school district, we have adopted the "literacy workshop model" as the vehicle for teaching language arts. I want to share as much as possible with her about some of these best practices in literacy teaching. 4) We have been looking at revising together in our classroom during writing workshop. I rely heavily on Georgia Heard's, The Revision Toolbox, when I teach revising. I love her idea of breaking the "toolbox" into 3 sections: words, structure, and voice. This week, we looked at the "word" section of the toolbox -- we talked about specific nouns and powerful verbs. We also tried to improve sentences like, "It was fun," and "I had a nice day." 5) I have a busy weekend ahead of me -- my goddaughter's wedding open house, my daughter's 18 birthday tomorrow, going to the movie The City of Ember on Sunday and meeting part of my class there, a family birthday celebration for my daughter my parents, my husband's dad, and my brother. All fun stuff; just busy. I just have to tag on to what Bill said yesterday about James Preller. On a professional note, I am delighted that James Preller will be coming to our school, and I'm especially looking forward to watching him do some writing workshop-style seminars with our older students. As I read his blog, I love his writing tips, and I will be using them for revision mini-lessons in my classroom to enhance our writing workshop before he even comes for his visit. I trust that the students will love meeting an author whose blog we will be following. On a personal note, when I opened my email Tuesday, and saw an email for me from James Preller, I have to tell you --that was way too cool!!! How often does an author, whose work you enjoy, email you? For me, not many, which makes it all the more exciting! His email had a link back to his blog, sharing that his editor just called him to let him know Six Innings had been named to the New York Public Library's "100 Titles for Reading and Sharing." Congratulations to James for the well-deserved recognition his Six Innings received! We look forward to our visit with James Preller at Bailey! Kudos to Bill for orchestrating all of this. As part of my job in the library, I'm responsible for hosting an author at our school, every other year. We haven't done it in at least two, and probably three years, since I played the "rookie" card last year. I knew I wasn't getting out of it this year, so I met with the PTO chairmoms for the author visit and threw some things out for them to consider. The first, and probably biggest, was to decide how big we wanted to go. We had a choice of going with a local person which would make the communication, travel and expenses easier, or we could try to get a big national name in, although I was a bit afraid we might be too late for this. Not surprisingly, they opted for the big national name and I wasn't totally disappointed, why not go big. I had prepared a list of authors that I thought we could still get based on visits to their websites and showed them some of the books for each that we had on hand in the library. 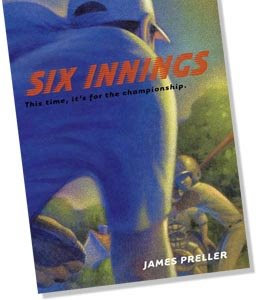 Almost immediately, they went for James Preller, author of the Jigsaw Jones Mystery series f or our younger readers, Along Came Spider(Karen's review) and Six Innings for our older readers. I was more than excited about their choice, since my partner, Karen, had communicated with James on numerous occasions through our blog. In addition to Karen, my friends Maria and Joyce have had electronic conversations with him, so there was a natural tie-in to our building. And so the wheels were in motion. The only real snag we hit was that he wanted to come for 2 days to make the travel worth while, understandable. I was unable to find another interested building, so I threw out the idea of having a two day visit. 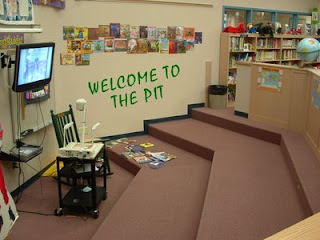 The first, a typical author visit day, the second a more intimate writer's workshop, if you will, with smaller groups. James has been more than accommodating and my library committee is excited about the possibilities, too. Today I got two pieces of good news that make me even more excited for March. The first is that the flight is booked, so James Preller is coming, and the second is that his book, Six Innings, that I reviewed here was recently chosen as a New York Public Library Top 100 book! Read more about it here. Congratulations, James! Bailey is looking forward to your visit. Could it be with the first real cold weather of fall that I'm already longing for summer? I don't really like the cold weather that winter brings in Ohio, but thanks to my ancestors who couldn't go any further south or west, here I am. 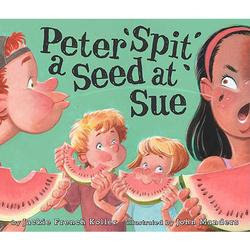 That may be the reason that this book appealed to me so much, the simple fun of eating watermelon and spitting the seeds at your friends. What says summer better than that. The book starts on one of those lazy, boring summer days when all a kid wants to do is stay cool. Even the old dog is hot and bored. Nothing sounds like fun until a man peddling watermelon starts passing out the sweet summer sensation. After the first bite, Peter spits a seed at Sue, hence the title, and the rest is downhill from there. Jackie French Koller captures the fun of a seed spitting fight with her simple rhyming words. Soon the mayhem spreads all over town and the pictures by John Manders are laugh out loud funny with seeds stuck everywhere, on people, on windows and cars, and on laundry hanging on the line. Everything comes to a screeching halt when the mayor shows up. She does not look happy with the events, until she spies a baker with a cart full of whipped-cream pies! Actually, I know lots of old teachers, but that's another blog post completely! I started a new book in THE PIT last week that has been good for lots of squeals and laughs. I Know An Old Teacher is a twist on the much used old lady and the fly theme. Anne Bowen takes the familiar rhyme, mixes in a teacher keeping the classroom pets for a three day weekend, and fun ensues! The teacher swallows a flea in her tea, a spider that crawled beside her, a fish that goes swishity swish, a rat in two seconds flat, a snake named Jake that is as smooth as a chocolate shake, and Lizzie the lizard that gets stuck in her gizzard. The kids are having a great time repeating the verses along with me, and I must say, it gets a little loud from time to time, go figure! The illustrations are done by Stephen Gammell who also did The Relatives Came, one of my all time favorites. The detail and color is amazing. The pictures of the teacher swallowing a spider and a rat downright gross in a really fun way. The teacher's wild red hair is hilarious and brings laughter from the kids every time. By the way, my friend I like to call Vince, remember him from The Sea Serpent and Me? Came to me last week and told me that he had another new book recommendation for THE PIT, and guess what it was...I Know An Old Teacher on the exact day that I started sharing it. He's good! Another review at The Friendly Book Nook, Charlotte's Library. I liked Karen's idea of Friday reflections so well, that I asked her permission to join her from time to time. Hopefully they are interesting to others, but if nothing else, it's good to process a week and look at accomplishments and goals for next week. 1. We wrapped up the first book fair of the year on Thursday. It's an understatement to say that it was a success as our sales were drastically up from last year's fall fair. In these economic times my aid Yvonne and I were feeling pretty proud of ourselves. The Scholastic people were too! 2. I worked on a couple of assignments for the librarian class I'm taking. I wish I felt that it was more than just jumping through hoops, but at this point that's how I'm feeling. That's not to say that I haven't gained anything from the class, but I do notice it cutting into my reading time and I miss that. It will all be over in a few weeks and then I can focus on reading and blogging. 3. I agreed to be on the committee for the Dublin Lit Conference as the representative of my school. For anyone who knows me, this is a major announcement! I've only attended this premier conference two times and both times as a presenter. Both times I left as soon as my session was over. I guess I'll spend the whole day this year, and, actually, I'm looking forward to it. Come see us, Karen and I will be doing a session and one of the authors is a favorite, Barbara O'Connor! It seems like there ought to be more to say after a busy week, but that's it for my first installment. It's almost game time, so I need to go cheer on the Buckeyes! 1) Today was a day off, and I enjoyed it to the fullest, doing all sorts of things I can't normally fit in my schedule during the school year. I woke up at 5:30 (AM!) to walk with a friend, followed by some strength training at Curves, picked up some paint for the wonderful painters that have stained our house this week, and needed some fabulous green paint for our front door and shutters, went to lunch with friends (more about that later), did errands, got 2 new beautiful pair of black pants (everything goes with black) one size smaller than I have been wearing (!!! ), wrote an article, had a fabulous Italian dinner, and am now playing on my computer, doing blog stuff. Great day!! 2) The 2 friends I met for lunch are my grade level teammates. We literally work beside each other five days a week. But we realized, during the course of our conversation, that being in close proximity at work, doesn't always mean we're staying abreast of each other's personal lives. This out of school experience helped us catch up on each other's lives. In addition to that, we did some thinking about where we're headed in writing workshop and Book Clubs. The relaxed atmosphere really allowed for some creative, uninterrupted thinking. We will definitely be putting more of these "dates" together on our calendars!! 3) Did I mention last week how much I love sharing City of Ember with my class?!! We are having so much fun with it, and the conversations that take place each day are fabulous!! I am so lucky I get to be a teacher, and see the excitement and anticipation on my students' faces as I read aloud. What a great job!! 4) Because this was a 4-day week, and I was out at a district language arts meeting for one of those days, I didn't have a good feel for how writing workshop went this past week in our classroom. To coin a phrase of Regie Routman's, I need to remember to always "teach with a sense of urgency". We have important work to do together this year in 5th grade, and it is my job to make sure that what we do is important and meaningful. Food for thought. 5) That language arts meeting I attended this week was both good and bad. Good -- it really pushes me professionally to be in a group of smart people, all looking for "best practices" in literacy instruction. Bad -- as if my "to do" list wasn't big enough, there are always more new tasks that need to be done after a meeting like this. I'm considering this my contribution to literacy back in my building. That's all for this week. I hope you all have a great weekend!! I found the cutest picture book today in the new book section of the library -- Penny and the Punctuation Bee by Moira Rose Donahue. If you're a fan of the Eats, Shoots, and Leaves books by Lynne Truss (her latest was Twenty-Odd Ducks), then this is a book you will probably enjoy, as well. Penny is a period whose best friend is Quentin, a question mark. Penny is part of the safety patrol because she is good at stopping. We also meet Connie, a comma, and Elsie, an exclamation point in the story. Not surprisingly, they all speak in sentences that contain their punctuation mark. The drama starts when a sign appears announcing a Punctuation Bee, Friday at 2:00. All the characters sign up to participate, and then begin their training for the Bee. The day of the bee, we also meet Collin, a colon; Stella, an asterik; and the quotation mark twins, Quinn and Lynn. And the contest is on!!! There is even a scoreboard keeping track of everyone's progress. 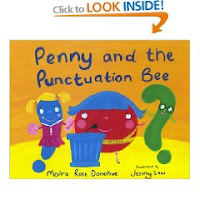 Penny and the Punctuation Bee is lots of fun, and its use in the classroom could range from first to fifth grade. It's probably geared toward the younger students, but, in my experience, even 5th graders enjoy, and learn from, books like these. Fun story line, great play on words with the punctuation names, likable characters, and good sentences modeled with each punctuation mark make Penny and the Punctuation Bee a book I need to add to my "Fun with Language" tub!!! Big Plans: I reviewed it here, and the kids liked it a lot. This was the first Pick from THE PIT, to hit the road when I read it to my sister's class in Ashland, OH! Wild Boars Cook: What could be more fun than a bunch of wild boars cooking a MASSIVE PUDDING! The last two words must be said loud enough to be heard in the classroom above the library! Franki reviews Wild Boars at A Year of Reading. Beware of the Frog: I love the surprise ending of this one, and was sure to be watching the kids' faces when it was revealed. I reviewed it here. Baron von Baddie and the Ice Ray Incident: A silly little book with great collage looking pictures. Read with a cheesy German accent made it fun and brought out some good laughs. Old Bear: I read this to kindergarten and preschool only. The colors in the pictures make for another Kevin Henkes classic. The Retired Kid: I reviewed it here and even though some of the first graders had trouble with the concept of being retired, they still liked the pictures and some of the story, especially when he sits on the false teeth. Goodnight Moon: Not a favorite of mine, I know, I know, that's almost blasphemy in the world of children's lit, but it's the truth and I feel better for saying it! I read it to set up my next pick. Goodnight Goon: A "petrifying parody" of Goodnight Moon. Very fun with "Goodnight tomb and goodnight goon" to "goodnight moans and goodnight groans!" Read with the best spooky voice you can conjure up this book is pretty fun for the Halloween season. Have fun with the list, and let me know about your experiences if you try any of my suggestions. In our 5th grade classroom, we do something called "The Top Ten" every Friday. We reflect on the things that were important to us as a class in the past week. We chart all these ideas, and then prioritize them into a "Top Ten" list that reflects our best from the past week. It gives us shared history as a class. 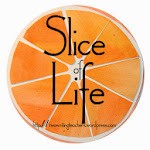 I've also been reading Katie's (Creative Literacy) posts about her "Friday Four". I've been intrigued as I've read her posts. Her willingness to take a few moments to process some of the major events of her week always makes for interesting reading. I think the concept of looking back and reflecting on what came before is an important activity, so tonight, borrowing from my own class and Katie's Friday Four, I'd like to start my own Friday Reflections. 1) I met individually with the parents of all 24 of my students this past week on Tuesday and Thursday evenings. The conversations we had during these conferences were so important. I shared all that I've learned about each child in the past six weeks, and then we started to chart a course together of where we will go from here. What a powerful way to build a community of school, teacher, parent, and child! I have such a fabulous class this year, and this is one more opportunity to learn how to push these students to be even better than they were before. The conferences re-energized me to focus on each student's individual strengths, weaknesses, and plan my workshops to best meet their needs. 2) My father-in-law came to live with us, for at least a month, this past Sunday. Because of a recent surgery he had, he still has trouble swallowing, so there are some dietary adaptations we need to make for him. Watching him during this transitional time, makes me very grateful for the good health I enjoy. 3) My youngest daughter, who is a senior in high school, brought home an order form today for graduation caps, gowns, announcements, etc. Where did the time go?!! I swear it was only yesterday that I saw her playing in her sandbox, learning to walk, running around the house in her walker, swinging on the swing for hours, heading off to kindergarten carrying her Pocohantas book bag, wearing her favorite Little Mermaid dress. 4) My students and I are immersed in the read aloud, The City of Ember, by Jeanne DuPrau. The plot's twists and turns in recent chapters has their full attention. In addition, the movie of the same name opened today in theaters. I showed them the trailer, and we are planning a weekend trip to the movies in 2 weeks to watch the film together. They are so excited about this! I look forward to the prospect of the rich conversations we can have after the movie as we compare the book and movie. That's all. I hope you have a wonderful, relaxing weekend. This summer, in my school district, we had a Leadership Academy that focused on shared leadership in education. During one of the breakout sessions, I was fortunate to be placed into Mary Lee's (A Year of Reading) conversation about building literacy in the classroom. She shared many wonderful things during the session, but one of her ideas that I held on to was the idea of introducing a class to many different books of poetry by the same poet. The concept was to immerse the children in the works of one writer, and to let them see the variety of writing one person can do. A great compare / contrast conversation! Anyway, one of the poets she has shared within her own class is J. Patrick Lewis. He is a fairly prolific writer, and the students would see some wonderful samples of many types of poetry. She shared with the group some of her collection of J. Patrick Lewis books, and I was amazed at how much he has written. So, with Mary Lee figuratively sitting on my shoulder, I set about to start my own J. Patrick Lewis collection. The last time I was at Cover to Cover, I purchased Scien-Trickery: Riddles in Science and The World's Greatest Poems. Then, in a recent district classroom library update, all 5th grade teachers received VHERSES: A Celebration of Outstanding Women. All of these books were either authored or co-authored by J. Patrick Lewis. You can see the variety in just these titles alone. But, when I was at Cover to Cover last weekend, another title jumped out at me: Wing Nuts: Screwy Haiku. I 'm a sucker for a clever title, so I walked over to the poetry section, picked it up, and noticed that J. Patrick Lewis was one of the authors of the book. I was obviously meant to have this book, so I got it! Not a thing serious in this book, but there are so many wonderful word plays. 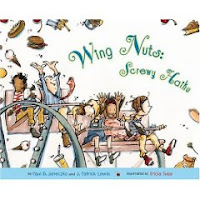 I predict that my students will fall in love with Wing Nuts: Screwy Haiku, and it will become a new favorite read on Poetry Friday (and probably other days as well!). A note to readers -- I just noticed that for all my posts this week, I dealt in the humorous. As much as I love a well-crafted, beautifully written book, I need humor in my life, also! This must have a been a week I gravitated to more books like that than normal. Just an observation. It's book fair time again, and I'm looking for "that" book, like Swindle last year, that will capture the kids' imaginations and fly off of the shelves. 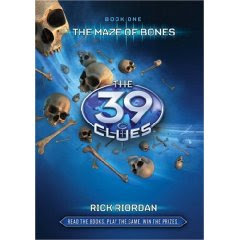 My first read from the fair is The 39 Clues: Maze of Bones by Rick Riordan. For those of you who have been living under a rock, like me, and are totally unfamiliar with concept of The 39 Clues, a brief explanation based on my limited research. There are 10 books planned for the series, all written by different children's authors. Book two comes out in December and is written by Gordon Korman, so they are using quality talent to create this series. There are a couple of commercial tie ins that at first made me nervous, but after looking at them I've changed my mind. First there are decks of collector cards, each book at the book fair comes with six included. They puzzles, background info on characters, spy devices and other fun things. In addition, each has a code number that can be entered on a website, which brings me to the second feature of the series. Readers can log onto The 39 Clues website, set up an account and begin collecting the cards on line. It appears that some of them will cause things to happen on the site and help readers solve even more puzzles. After my initial unease with these two features, I came to the realization that meeting kids as readers in their comfort zone just might work! After all, isn't that what we as teachers strive for? Finding things that will get kids interested in reading? This series does that a so many levels. I was able to log onto the site and create an account. Loads of fun activities, some that involve reading, others that are just game type things, but all entertaining and designed to get the kids into the books. It reminded me a lot of the old Carmen Sandiego game, only updated and more sophisticated. As for the book, I liked it. I've not read any other Rick Riordan stuff before this, so I have nothing of his to compare it to, but the plot is catchy and the action non-stop. It involves the orphaned Cahills, Amy and Dan. When their grandmother, Grace Cahill, dies, they discover that they are part of the Cahill family that can trace its ancestry to just about every great, historical figure in the history of the world. This book revolves around their famous relative, Ben Franklin. After the funeral, many of the existing Cahills are invited to the reading of the will. Each member is given the choice of taking a million dollars, or going on an elaborate scavenger hunt of 39 clues (hence the title) to discover the thing that made the Cahills the most important family in the history of the world. Of course, Amy and Dan take the challenge, and along with their reluctant au pair, the begin an around the world challenge. I was reminded of the National Treasure movies which have been very popular recently. Because Amy and Dan are most closely related to Grace, the other dastardly villains try to follow them and eliminate them from the challenge. The threats are real, but the kids manage to escape every time with only minor injuries. For an adult reading it, the book takes some far fetched turns, and reality must be suspended at times, but for kids it will be a fun exciting read. I'm excited for some of my students to start the challenge and keep me up to date on what happens on the website when they enter their codes and solve the puzzles. Frankly I can't wait until December to read the next one. This series should be the next big hit. Check out Franki's "simulblog" at A Year of Reading. The Scrambled States of America Are Back! Laurie Keller, the author of the new The Scrambled States of America: Talent Show, is a genius when it comes to amusing me and making learning fun for my students! Her use of word play and puns is delightful. And it's not just the words in her book that are amusing; the pictures and illustrations are so clever. They are not to be overlooked when reading one of her books. Some of my favorite books (and my students) by Keller are Do Unto Otters: A Book About Manners and Open Wide: Tooth School Inside. The latter is one of the most popular choices for my students on nonfiction Tuesday and Thursday. All that being said, when I saw that Keller had a new book out, The Scrambled States of America: Talent Show, I just had to have it!! So, when I was at Cover to Cover last weekend, I picked up The Scrambled States of America, and when Sally Oddi (owner of CTC) told me there was a new version of the Scrambled States, I just had to order it. Both books will work amazingly well in my classroom. I teach 5th grade, and one of our state indicators is to be able to locate all 50 states on a map. My students literally started learning the 50 states this past week. How perfect to share these funny books about states. They laughed out loud when I read aloud The Scrambled States of America, and now, they all want to be the first person in the room on nonfiction Tuesday or Thursday, so they can "snag" this book to read for themselves. In my opinion, however, the newest Scrambled States book is better than the first!! It's full of all sorts of hidden "funny"! Since all the states got to know each other better in The Scrambled States of America, in the second book, it is only natural now that they might want to do things together. So, when New York wakes up in the middle of the night, and says, "Let's have a talent show!" every state wants to jump into the action with their new state friends. 1) Idaho getting ready for the talent show, and asking, "Does this grass skirt make my BUTTE look big?" 2) When Georgia can't stop shaking during her peach juggling performance, she goes to see the doctor to try and find out what's wrong with her. Dr. Globe gives her some tests, and checks her square miles, temperature, and average yearly rainfall. In addition, he xrays her to look at her cities and counties. 3) Michigan doing a ventriloquist act with the lower peninsula being the talker, and the upper peninsula being the dummy. 4) New York, New Jersey, New Mexico, and New Hampshire singing as "The New States on the Block" while the crowd (the other states) go crazy!! 5) The intermission picture where the girls' bathroom has a humongous line, and the guys are getting right in to take care of business (any female can relate to this scenario). 6) Pennsylvania playing a tune on the Liberty Bell. 7) Wisconsin doing cheesy sculptures. 8) Iowa telling corny jokes. 9) Florida and Colorado joining themselves together to do an impersonation of Idaho. Also, Wyoming and Tennessee doing the same to impersonate Oklahoma. 10) After the talent show, when the states all go home, the page where they chat with each other, is a hoot! 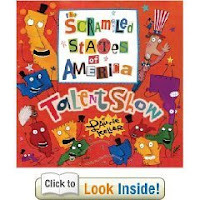 Scrambled States of America: Talent Show is not just a funny book; kids will be learning the states as they read. The states have distinctive shapes rather they're connected on a map or performing in a talent show. I'll be sharing this gem of a book with my class on Monday, and I'm sure it will be as wildly popular as the first one. The title alone made me love this book, Geek Chic, by Margie Palatini. The cover just shouts, "Pick me! You'll have a lot of fun!" It's all bright colors, and bold lettering. Combine that with stars all over the cover, and finding out the main character's name is Zoey -- who could resist this book? Well, let me tell you, I certainly couldn't!! "... being halfway to eleven is when you really absolutely need a fairy godmother the most. I'm going to require major fairy dust intervention in the hair department alone. There are just so many days a person can wear a hat, if you know what I mean." And she's not kidding -- she spends most of the book waiting and wondering which person she meets will be the fairy godmother that is going to put her on the path to being "chic", just like "The Brashleys" (abbreviation for the 2 coolest girls in school -- Brittany and Ashley). **As a side note here, as an adult, I love how Palatini incorporates pop culture into her book; if there's a "Brangelina" in many gossipy magazines, why not a "Brashley" at Zoey's school? Back to my original point, though -- the Zoey I saw on the outside cover is exactly like the Zoey I encountered on the inside -- hats off to Palatini for that accomplishment! One of my favorite things about this book is how it is plastered inside with post-it notes. The chapter titles, notes to the readers, notes to herself, her reflections -- all on Post-its. I am never far apart from a pad of Post-its to mark my thinking as I read or work, so this design technique really worked for me. 1) The way this entire story is told in stream of consciousness by the main character, Zoey. Very funny and so real! 2) The use of a wide variety of fonts -- very effective and very fun! 3) How, when Zoey is trying to set a scene for us, the text will turn into a play or a comic strip / graphic novelette. Both make the reader think a little more, but so much can be gained by reading the characters' motivations in the play, and inferring information while looking at the details of the pictures in the comics. 4) At a couple of times in the book, Zoey initiates a count-down to drum up suspense -- 5, 4, 3, 2, 1 -- each number on its own page. It made me curious each time to know where Zoey's thinking was headed next. 5) The Chic ZoCabulary list provided at the end of the book. Zoey is taking Italian lessons, and her speech is full of Italianized words, along with some of her own words, as well. I think this is a list with which most girls will be able to relate. 7) Zoey has her own website that is very interactive. The big issue in Geek Chic is that Zoey is a fifth grader who knows she has only 198 days to be ready for 6th grade and middle school. Not academically, but in the coolability ratings. As someone who teaches 5th grade, I know that Zoey is not alone in thinking she needs to find a "coolness factor" before middle school. Many girls (and boys) struggle with that. For this reason, I think Zoey will appeal to lots of girls in this age group. The ending of this book made me happy, and I think will hold hope for many girls who don't think they are as cool as the "Brashleys" of their school. I can't tell for sure, but the ending also leaves the door open for the possibility of a sequel or a series. 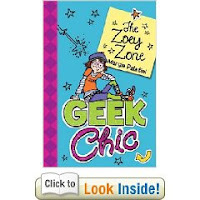 I'm delighted I found Geek Chic at Cover to Cover last weekend with several other of my Central Ohio blogger friends, and now, I can't wait to put it into circulation in my classroom. I think it will be very popular, and I know it will be accessible to a wide variety of reading abilities as well. This year, awards will be given in nine categories (Easy Readers, Fantasy & Science Fiction, Fiction Picture Books, Graphic Novels, Middle Grade Novels, Non-Fiction Middle Grade/Young Adult Books, Non-Fiction Picture Books, Poetry, Young Adult Novels). Anyone can nominate books in these categories (one nomination per person per category). Nominated titles must be published between January 1st and October 15th of this year, and the books must be in English (or bilingual, where one of the languages is English). To nominate titles, visit the Cybils blog (http://www.cybils.com/) between October 1st and 15th. A separate post will be available for each category - simply nominate by commenting on those individual posts. If you are not sure which category to choose for a particular book, a questions thread will also be available. The Cybils is a fun blog to watch in the upcoming months. Find a category(ies) that interests you, and follow it to see what nominees pop up. I love Thanksgiving! It's my favorite holiday of the year, no rushing around, no commercialism, just good food, fun family time, football, and relaxation. I was very excited to find a new Thanksgiving book to share in THE PIT, and it just happens to be a rhyming book. This is the Mayflower, sturdy and strong. Her sails skim the skies as she journeys along. This is the Feast follows the Pilgrims on their journey across the sea to start a new country. It's a very basic version of the story that all kids know, but Diane Z. Shore puts the words together in an enjoyable quick moving version that I think kids will enjoy. "Welcome" their greeting, approaching with care. Along with the lyrical writing are Megan Lloyd's painted masterpieces of Pilgrim life in Plymouth. Vibrant colors, delicate details, and realistic scenes illustrate the words and will wow the kids in THE PIT! I love that I will be able to share another new Thanksgiving book with them. the friendships and freedoms we all share together. Check out Two Writing Teachers for more Poetry Friday. What the Heck's a Hinky Pink? 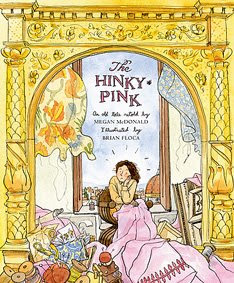 It's a great new book by Megan McDonald and illustrated by Brian Floca, that's what! Or I guess I should say it's an old tale retold by Megan McDonald. Either way, it's a lot of fun and kids will enjoy it. Unfortunately it's too long to share in THE PIT, but classrooms doing fairy tale studies would find it very useful. Anabel, not Anabella, is a very talented and speedy seamstress who dreams of sewing a beautiful ball gown for a princess. As in all fairy tales, she gets her wish and is whisked off to the castle where she is locked in a tower room, (Is this classic or what!?) and told to create a beautiful gown in one week! Of course the room is filled with all of the most wonderful material and lace, everything Anabel dreamed of sewing with. When she goes to bed, she is bitten or pinched in a most awful way. All of her covers are stolen and she is unable to sleep. Of course the next day her sewing is atrocious and she is unable to concentrate. Another servant does some investigating and finds that Anabel is being tortured by a Hinky Pink and she will need to make it a bed to sleep in before it will leave her alone. Anabel goes through several beds and the Hinky Pink is never happy. Too high and too hard; Too high and too hard! Too dark and too deep; Too dark and too deep! Finally Anabel satisfies the Hinky Pink's sleeping needs, completes the gown, and they all live happily ever after, as they should in a good fairy tale! Brian Floca's illustrations complete this story and give the book a classic look. In his notes at the end he spotlights actual Italian buildings he features in his artwork, and the Hinky Pink is shown no bigger than a push pin. Very entertaining and complimentary to Megan McDonald's retelling. I discovered this beautiful book on the new book shelf at the library. 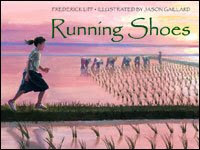 Written by Frederick Lipp, whose charity organization provides educational opportunities for children in Cambodia, Running Shoes is a simple but moving tale of a young girl, Sophy, who has dreams of an education. Eight kilometers stand between her and the nearest school, and she has no shoes. When the "counting man" comes to her village he realizes she is staring at his running shoes. He takes her measurements, using the mud by the river in her village, and after several weeks, Sophy receives her shoes from the mailman. When she models them for her mother Sophy tell her mom that now her wish can come true. Her wish is to attend school. The next morning Sophy runs the eight kilometers to school and is the only girl. She has to stand up to the boys by out running them in a race and then she is accepted. She continues to run to school each day until the "counting man" comes back. Sophy then thanks him by writing him a note in the river mud and telling him that one day she will help her people by building a school and being a teacher. Jason Gaillard's paintings are fabulous. He blends the pastels of sunrises and sunsets to take the reader to the countryside of Cambodia. The facial features and characteristics are alive with emotion. I especially love the end pages and the symbolism in them. I've included one of the illustrations at the top but the size of it really makes it hard to see just how wonderful the artwork is. Check out some information on Frederick Lipp's organization, Cambodian Art and Scholarship Foundation.